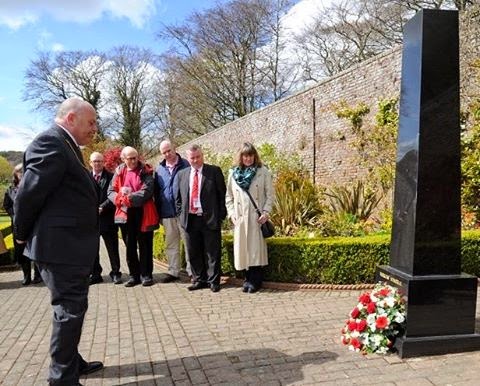 Once again this year, local trade unionists and citizens joined councillors from both Aberdeen City and Aberdeenshire, in a poignant service to commemorate Workers’ Memorial Day on 28th April, in the beautiful setting of the Persley Workers’ Memorial Garden. 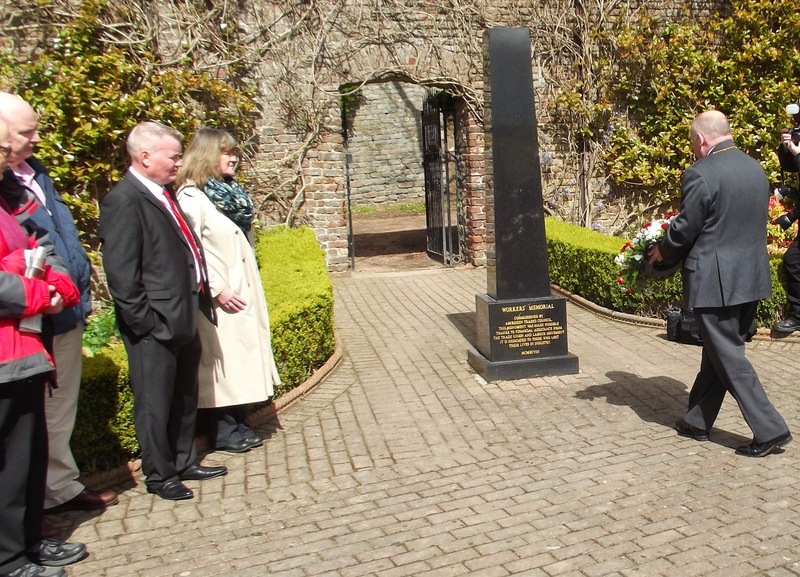 Welcoming people to the service, ATUC Vice President, Kate Ramsden asked those present to join her in a minutes silence to remember all those who had lost their lives at their work. 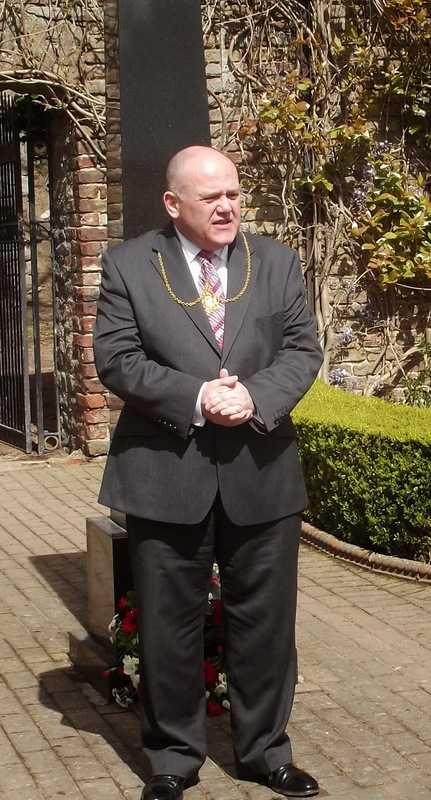 Councillor Barney Crockett, on behalf of the Lord Provost of Aberdeen, then laid a wreath in their memory. 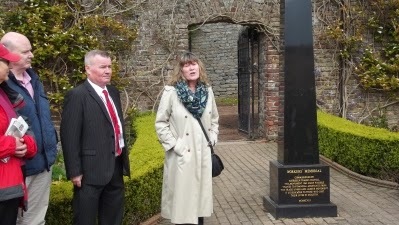 Barney paid tribute to the work of the trade unions in fighting for robust health and safety in the workplace, over the years and still in the present day. 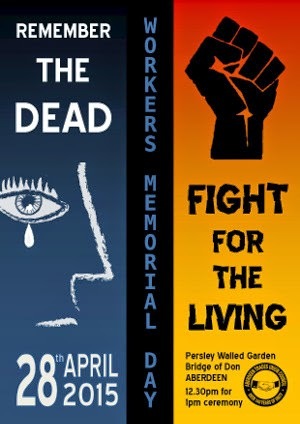 He said, “This is a day to honour the working people throughout the world who have lost their lives while going about their daily employment. 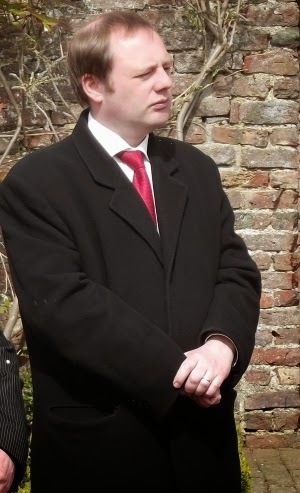 "No death or injury at work is acceptable"
Richard Baker, MSP also said a few words, thanking the Trades Union Council for keeping health and safety high on the agenda. 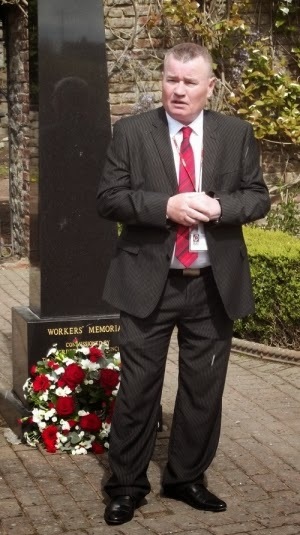 He spoke of his private members' bill which, if passed would make company directors in Scotland criminally liable for workplace deaths caused "recklessly" or through "gross negligence" and thanked his union UNITE and other trade unions for their support for the bill. Mr Baker said: "It is long-established that Scots law is not adequately equipped to prosecute employers and managers whose negligence in the workplace results in people losing their lives." Richard said, “No death or injury at work is acceptable. By strengthening the law on corporate responsibility for workplace safety failures we can encourage organisations to improve safety standards. Ann Joss from the RMT said that our thoughts today were with all those who had lost loved ones through just doing their job. She spoke of her members working in the North Sea, one of the most dangerous places to work, and said that the kind of tragedies we had seen, like the recent helicopter crashes could not be allowed to happen again. She called for anti trade union laws to be repealed. “Everyone has a divine right to expect to be able to go to work, stay safe and get home safe, and that’s what we must keep on fighting for”. Kate Ramsden spoke on behalf of the ATUC saying that last year 135 people in the UK were killed at their work with many more injured and made ill. “And in some parts of the world, health and safety is almost non-existent, with workers killed, injured and made ill because big business and governments put profits before the health and well-being of the workforce,” she added. 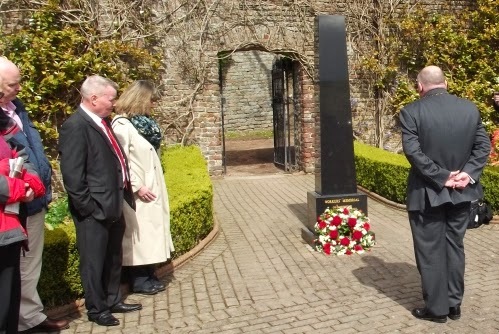 She reminded those gathered that this is the thirty year anniversary of the Bhopal disaster which killed 25,000 men, women and children, with many more left chronically ill and a new generation living with its awful aftermath. "We owe it to their memories to fight for the living"
“We mourn everyone here and around the world who have lost their lives through doing their work, but like the FACK families we know that isn’t enough,” said Kate. Steve Dillon recites "Tesa Boss"
This is the story of young girl called Tesa Boss. As a young girl she played around with her father around and around. Her father went to work each day a joiner by trade to bring home the pay. Construction workers from all around. Through no fault of their own they worked with this stuff. That killer dust - asbestos. Installed into houses from roof to the ground. Her father came home from work one day. I feel a bit rough. I’ll play with you later as he started to cough. With a tear in her eye. Ok dad and she started to cry. Now those coperated bosses they knew fine well. This stuff was a killer the records will tell. And for the crimes they committed they should all go to jail and if its too late. "Stand up for working peoples' rights"
As they sit in their villas blowing smoke to the sky. Champagne and caviar they don’t blink an eye. It’s cheap and its cheerful we can buy it in bulk. They put it in places that you will not believe. Some I will tell you. From roofs tops to soffits, down chimney flues, bin shutes. Behind cookers even in shoes. In artex to lagging I’ll just name a few. You will find it in buildings in floors to the walls. Fire doors sprayed coatings and I’ve not named them all. 30 years later as she walks down the aisle her mother beside her she can’t even smile. Her father was lost some 2 years ago. They put on death row. This sad story is told week after week. As families and loved ones are starting to weep. Some will tell you legislation’s too tough. That we are not doing enough. As she muttered those precious matrimonial words. Tesa Boss is not her real name. Just like the killer that turns. She’s hidden in the word.